From The New Criterion. December 31, 2015. You may remember that in our last installment we left the Republican party — or at least the media’s account thereof — in what Sean O’Casey’s Paycock would have called a terrible state o’ chassis over the succession to John Boehner as Speaker of the House. Of course it was not to be expected that when, in response to desperate pleas from a party so afflicted, a reluctant Paul Ryan stepped forward to unite it (more or less) behind him as the new Speaker, the media were going to let go of so fruitful a "narrative" as this story of frightful chaos in the party they so despise. "Paul Ryan is right about the House being broken. But he probably can’t fix it," wrote Chris Cillizza in The Washington Post — and, a few days later: "Ryan has a lot going for him. But he’s still unlikely to heal a broken House." 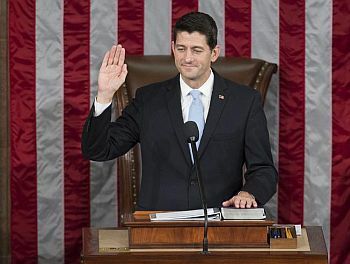 A Post editorial was headlined: "Good luck, Speaker Ryan. You’re going to need it." The editorial identified the usual suspects in this story of political mugging as the "hard-right" of the party, who are known to themselves as the Freedom Caucus and to the Democratic party’s talking points as "extremists." Mr Cillizza preferred to stick to the euphemistic "polarization," but the point was the same — namely that Mr Ryan might be a decent enough fellow but he couldn’t really hope to rein in his party’s lunatic fringe, now supposed to be in the ascendant. Francis X. Clines of The New York Times penned a light-hearted piece comparing what he called Republicans’ "political cannibalism" and "frantic infighting for political survival amid the nation’s mounting problems" to a forthcoming TV show called "BrainDead" in which "the government has stopped working, and alien spawn have come to Earth and eaten the brains of a growing number of congressmen and Hill staffers." The show’s creators are quoted as saying, "It seemed like the best way to address the news today — not straight, but as the opening act of a horror movie"
Lest you think this was all just an airing of the journalists’ private opinions, evidence — or something that passes for it in the media — was produced in the shape of a New York Times/CBS poll in which respondents were asked: "Would you describe the Republican Party today as united or divided?" Unsurprisingly, since none of the respondents had any way of knowing anything about the state of the Republican Party except for what the media tell them, 22 per cent said united, 75 per cent divided. And even if they had not been told often enough how divided the party was, they could have guessed that "divided" was the safer answer and the one less likely to make them look like dummies who don’t know what’s really�@going on. All this, mind you, as Mr Ryan was winning the votes of 236 out of 245 voting Republicans for the Speakership. Thus having established by better than three-to-one majorities that the media narrative is the one people are willing to tell the media they accept, the poll also showed that, by better than two-to-one, they blamed Republicans "a lot" or "some" for political "gridlock" rather than Democrats. Could this result have been in any way related to the question: "Which do you think Republicans in Congress should do? Compromise some of their positions in order to get things done" (56 per cent) or "Stick to their positions even if it means not getting as much done" (39 per cent)? Do you suppose the pollsters realized that in that question they were giving away what they saw as the correct answer to the one about gridlock? They certainly would have left respondents in no doubt what they believed about the causes of gridlock, though in fact the reason for such divisions as there are in the party is precisely that, under Mr Boehner, it did nothing but compromise when it had promised their most dedicated supporters to fight. This is what I believe is known in the polling as in the computing business as "garbage-in-garbage-out," but it affirms yet again that the news is the media narrative and the media narrative is the news — as well, it seems, as the next season’s TV sit-coms. But the "chaos" narrative must have proved particularly compelling in this early onset election season partly because it fit in so well with that of the presidential contest. The sheer number of competitors, together with the theatrical defiance of the GOP "establishment" by the so-called "outsiders" in the race, especially Donald Trump and Ben Carson, seemed to promise an answering chaos in that other, more high-profile leadership contest that might keep the media tut-tutting all the way to election day. At any rate, the so called "debates" as organized by the media were designed to produce as much chaos as possible by not only pitting the candidates against one another wherever possible but also provoking them with insulting questions designed to create the impression, not entirely inaccurate, that it was in contrast not with the Democrats but with the media, and the media’s notions of political rectitude, that they were being invited to define themselves. This must have been apparent to the observant in the first two debates, but it became too grossly obvious to be ignored in the third, held in Boulder, Colorado in the week before Hallowe’en, when the CNBC moderators were actually booed by the audience, so blatant was their anti-Republican bias. This was especially the case with John Harwood, who asked Donald Trump if his was "a comic book version of a presidential campaign." Even the unembarrassable Mr Trump appeared dumbfounded by the question. Later, Ted Cruz got the biggest applause of the night by saying, "The questions that have been asked so far in this debate illustrate why the American people don't trust the media. This is not a cage match. And, you look at the questions — ‘Donald Trump, are you a comic-book villain?’ ‘Ben Carson, can you do math?’ ‘John Kasich, will you insult two people over here?’ ‘Marco Rubio, why don't you resign?’ ‘Jeb Bush, why have your numbers fallen?’ How about talking about the substantive issues the people care about?" Yet the cheers could not mask the fact that it really was a cage match, and designed to be one, as the candidates should have known it would be before they agreed to the media’s terms for appearing. Substantive issues were never going to be on any network’s agenda, if only because too many potential viewers, looking to see the candidates mix it up, would have been bored and tuned out. Their outrage at the way they were treated may have elicited cheers and even been reported sympathetically in the rest of the media — "Media Consensus Is That CNBC Was GOP Debate's ‘Biggest Loser’" reported NPR — but it encouraged them (or their handlers) to get together afterwards and issue a series of complaints and demands for change from the broadcasters of subsequent debates that only made them look like whiners. This was too easy an opening for President Obama, who told a fund-raiser in New York that "Every one of these candidates says, ‘Obama is weak, Putin is kicking sand in his face, when I talk to Putin it is going to straighten him out.’ Just by looking at him, ‘I’m going to — he’s going to be —’ And then it turns out they can’t handle a bunch of CNBC moderators on a debate.’"
It wasn’t the first time that the President or his apologists had attempted to cast domestic political disagreements in terms of international power politics and vice versa — a telling indication of the reason he has so often failed to deal adequately with both kinds of conflict. But in the narrower sense that the Republicans should have known what they were getting into when they signed up for these cage matches, he was right. Who was going to believe them when they said they were shocked — shocked! — to learn that the media were hostile to them and would do anything in their power to embarrass them? Calling CNBC the debate’s "biggest loser" was the mirror image but the functional equivalent of the headlines after the first debate that called Fox News the big winner. Either way, the media were always going to be the stars of the show. In any case, in a political culture where the new favorite tweeted curse is said to be "die in a fire" — it was invoked upon the head of Germaine Greer for publicly questioning whether a surgeon actually had the power to transform the former Bruce Jenner into a woman — is it even possible to hold a genuine debate anymore? Certainly those debates that we have seen so far in this campaigning season do not suggest that it is. The hate, often on the part of those most vehement against those they call "haters," has been more subdued when the haters have been brought face to face, but it has still been so unmistakable as to leave anyone watching in no doubt that personal feelings are far more important in our political life than anything that used to be thought of as public policy. Of course it is the media that creates this impression because personal feelings are much better box office than public policy, but the candidates apparently have to go along with it because otherwise they have no forum and no public presence of a kind that is necessary to be elected to anything above the most local offices. In a well-run polity, it would be absurd, outrageous, for political sages and elder statesmen of the Fox Business channel to decide which of the candidates were to be allowed to make their case to the public — and which on the main stage and which on the "undercard." And yet even the excluded victims must meekly accept their fate as if it were written in the stars. I’m not a big fan of Lindsay Graham, but I wonder if he couldn’t use his exclusion from the fourth debate as a way to gain access to that unmistakable screw-the-media sentiment that has done so much to power the candidacy of Donald Trump? Better, however, would be for all the candidates to get together to boycott and bypass the media, including Fox, which the ease of access to streaming video would make it easy for them to do. They needn’t make a fuss over it: just announce that they prefer that not only themselves but their competitors should have a chance to get their message out without any media mediation. They might also point to the effect such mediation has produced in reviving the candidacy of Hillary Clinton, once thought to be in some serious trouble. For when she was called to testify before the House Select Committee on Benghazi, a day after Vice President Biden removed himself as the last plausible alternative to her as the Democratic nominee, it was all media hands to battle stations. The Washington Post, certainly took no chances that readers might make up their own minds about how the former Secretary of State had performed under Republican interrogation. 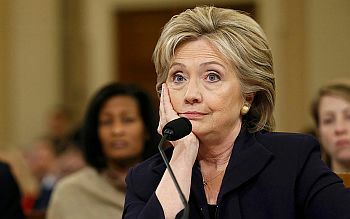 "GOP lands no clear punches while sparring with Clinton over Benghazi," wrote David A. Fahrenthold while the hearing was still in progress, while the main headline on the Post’s website the next morning read: "Clinton emerges unscathed from high-stakes Benghazi hearing." There were several other news stories of a similar tendency and an acknowledged editorial in which it was claimed that "the House Select Committee on Benghazi further discredited itself . . . as its Republican members attempted to fuel largely insubstantial suspicions about Hillary Clinton’s role in the 2012 Benghazi attacks." These "insubstantial suspicions" included her having publicly attributed the deaths of the ambassador and three other Americans to a spontaneous demonstration when she knew this was not the case and her having intervened in Libya on behalf of the business deal of a friend, Sidney Blumenthal, who was persona non grata at the State Department, when the ambassador himself was apparently unable to reach her with any of his multiple requests for extra security. Damning as these things might have seemed to some, however, they were (to use a favorite Clinton expression) "old news," while the committee "elicited little new information and offered little hope that their inquiry would find anything significant that seven previous investigations didn’t." Mrs. Clinton’s discipline and steely demeanor, bordering on dismissive at times, disarmed and irritated congressional Republicans as they questioned her handling of Libya as secretary of state, her response to the Benghazi attack and her frequent contacts with Sidney Blumenthal, a Clinton adviser who had been barred by the White House from working at the State Department. That the media’s rescue operation was not more widely recognized as such must owe something to the willingness of the GOP candidates to cultivate respectability (if not respect) in the form determined by the media by pretending to take them at their own valuation as objective observers and therefore neutral referees for the debates. But then, even many conservatives seemed to think that Mrs Clinton had been helped rather than hurt by the Committee’s grilling. I myself didn’t quite see the point of its pressing on with what had already managed to get itself cast, partly as a result of Kevin McCarthy’s faux pas discussed last month, as a partisan exercise. That, much more than any mistakes made at the State Department over Benghazi — mistakes do happen, after all — was the real scandal of the hearings. It was a frank admission that the spirit of partisanship is now such that the Congress is incapable of exercising its constitutional oversight function. Though there is fault on both sides in our coming to this pass — and much more fault in the partisan media — it is primarily the congressional Democrats’ decision to close ranks behind "their" President, no matter what he does, no matter how far he exceeds his constitutionally limited powers, that has caused it. And at least a part of what has caused that, it seems to me, is the habit of partisanship formed during the ill-advised Republican impeachment of Bill Clinton over the Monica Lewinsky affair — now being turned to such good account by his wife and would-be successor. But before that there were the Clarence Thomas and Robert Bork confirmation hearings, both of which managed to enlist the country’s legislature as full partner in and adjunct to the media scandal culture, which is now also informing the so-called debates, and so cement in place on both sides partisan hatreds that show no signs of ever dying. In this sense, the media topos of political "chaos" at the heart of our government has something to be said for it, though it is the media’s own hunger for scandal and political wickedness (also known as "extremism") and not the extremism itself which has caused it.